▼ Collect [2018 Assassin Commemoration Coin] from the Daily Quest [Year End Assassin]! The featured Daily Quest [Year End Assassin] will change every day. You can earn up to 2x [2018 Assassin Commemoration Coin] from each daily quest. ※ Clearing the Quest will award one, and winning against the second fight will give a second one. Collecting the [2018 Assassin Commemoration Coins] from the [Year End Assassin] Quests will complete the [Event Missions] giving you wonderful prizes! ※ Collecting the [2018 Assassin Commemoration Coin] will update the mission. You can sell the coin with no issue immediately. A large coin earned after defeating the powerful enemy in the assassin quest. Features a Fighter and a Ronin behind two walls who deal significant amounts of damage. Charm the Fighter so he cannot attack. You can do this by having your Charmer in the backline in the middle position since he does a 2x2 attack and having your strategy set to Target Leader. After he is charmed, you can defeat the Ronin while tanking his strong attacks, either through sacrificing your front-line or having a very sturdy frontline while you slowly deal damage. Features a Soldier in the front line and two banshees in the backline. The Soldier does a horizontal attack. One Banshee heals for 15k, and the other does 2x2 Ice Magic. At max level, you should be able to tank the Soldier and Banshee with a Fighter or Soldier in the front. I think you need ~1400 PDEF and 1000 MDEF. You can have a Cleric in the back healing off this damage (3-target or a 2x2 heal), and a Magician in the back tanking the magic hit too. Since it's a 2x2 magic, you can have another backline on the other side to attack without risking any damage. They Target Healer so you can have her on one corner to guarantee the other side doesn't get hit. You want to either focus down the healing banshee in one turn, charm it so it heals you instead, or chip all three enemies fast enough they die faster than they can be healed. It's probably easiest to single target the healing banshee. Features an Archer in the backline with two purple wolves and a white wolf in front. They Target Long but the wolves are fairly strong damage dealers so you may not want them all to focus down one front-liner. The archer shots are tankable behind a Soldier with a good Archer though, or with a Cleric. Safest way would probably be behind Aderina EP3. You should also be able to just charm the archer again with someone like Judita but he might randomly attack other units and kill them instead? Five slimes with very high ATK. They Target Healthy, so two or three Soldiers or Fighters in the front can split the damage between them, but they may do too much to completely negate. You can have glass cannons in the backline and then sacrifice the front with resurrection effects. They seem to ignore DEF or something because using DEF UP President Skill didn't do anything. Having a Rogue or Ronin in the front line to dodge some of the hits and reviving is probably more reliable than only tanking 3 hits with revive on a Soldier. 5 assassins 5 Bandits. They are surprisingly slow. It shouldn't be too hard to tank their hits. If you have anyone with PATK down or ATK down effects, you can make them do very little damage. The DEF threshold to tank them doesn't seem to be too high. At 1000 DEF you could tank the hits without dying with a lot of HP, i.e a Warrior, especially if you have ATK down. If they proc their PDEF down though, you'll take a ton of damage and probably die. I would recommend some form of PATK down to improve your chances of survival, and some cleansing heal for two frontline that can also DPS. The biggest hurdle will probably be surviving against the masked one after you've eliminated everyone else because of how much more HP he has, and he runs a higher risk of killing someone when he procs PDEF down. Last edited by Folseus; 12-31-2018 at 12:48 AM. Beside charming the banshee, since they are not boss character, you can also use character with lethal like Illya, can 1-shot one of them for 99999 damage. It was a lot more manageable with one of them down. I beat them with the usual Charlotte strat. The slimes lost a full round cause of stun and zap during which they got easily pwned with president buff. Anyways, since they lack backrow attacks, I think its possible to kinda have high def girls that go down after two hits defend the glass cannons in the back. 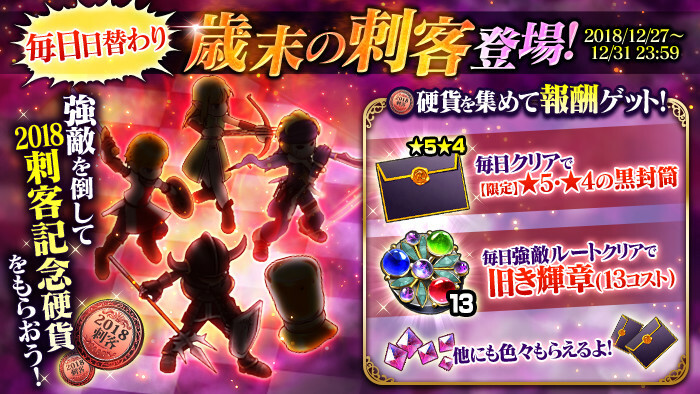 If the front girls also wear res armors, they are guaranteed to hold a full round, giving three strong girls in the back the chance to attack. If you use archers with 30% agi armors, it might even be possible to be faster than the slimes, but I did not try it cause I won by luck earlier. Just some thoughts on this one.